Elko, Nevada, holds a special event that recreates the old-timer's way of topping off the rough string. The Silver State Stampede Association in Elko, Nevada, sponsors a special event in conjunction with its annual PRCA rodeo held in July. This event is called Old West World Championship Bronc Riding. Beginning in 2003, twenty top bronc riders came from several western states, out of remote ranches and cows camps with names such as, State Line Camp, Kitchen Meadows, White Horse Ranch, and Devil’s Corral to ride the “bad ones”. These twenty bronc riders each put up a $400 entrance fee, with no stock charge, for a chance to ride for $8,000 in prize money and a World’s Championship buckle. Saddle bronc riding is the classic event in professional rodeo. This Old West version of the event takes bronc riding back to its origins when the big outfits sent their top “bronco men” to town to compete against each other. At the turn of the twentieth century, there were hundreds of cowboys working on cow outfits in the Elko area. It was a practice for neighboring cowboys to get together and ride the “rough string” to see who was the best. 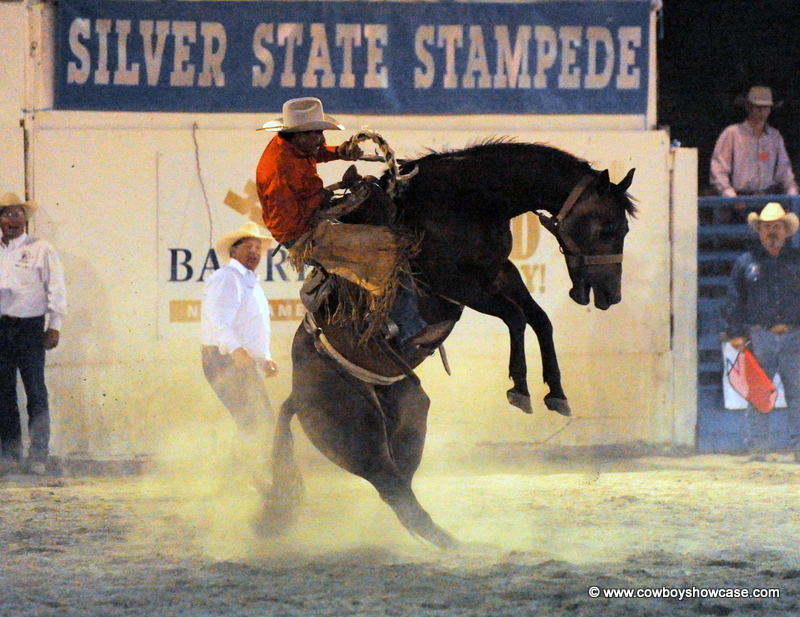 The Silver State Stampede is the oldest rodeo in Nevada. The tradition of an annual rodeo in Elko started in 1913, sponsored by G.S. Garcia, world famous bit, spur, and saddle maker. Garcia, who owned the G.S, Garcia Harness and Saddle Shop in Elko at that time, figured the rodeo would get northern Nevada cowboys gathered for a good time, and it would provide entertainment and income for the townspeople. Bronc riding, at that time, had a minimum of rules. Of course, the cowboy who made the wildest and showiest ride usually took home the money. The hands in the region would plan all year to attend this rodeo and try their luck. There have been many saddle bronc riders who came out of Great Basin high desert country to go on to the big time in the professional rodeo circuit. Names like Marvel, Wines, Slagowski, Gardner, and others are well known throughout the West in bronc riding circles. Fifty years ago, the Prunty Brothers trailed their native bucking stock over 100 miles from the Diamond A Desert, which straddles the Nevada-Idaho border near Charleston, Nevada, to put on the Silver State Stampede. Continuing this tradition, the bucking stock for the Old West Bronc Riding this year was furnished by Wally Blossom from Owyhee, Nevada. The broncs used were a mixture of big strong horses that had bucked before and some young horses that had only been bucked out of a chute once or twice before. The riders used their own stock saddles and a standard bucking horse halter and buck rein and the horses were turned out from regular bucking horse chutes. The riders rode in typical buckaroo style gear including chinks, some flat hats, and occasionally, Garcia spurs. There were very few broncs that did not buck well and it was a very even pen of horses. Two experienced cowboy pickup men were used to pick up the bronc riders and clear the horses from the arena. Two experienced rough-stock judges marked the rides. Unlike the original old time bronc riders, where the rider rode the horses until they quit, this event was timed for an 8 second ride. And the broncs did buck!! Using a standard stock saddle, slick-fork saddle, or slick-fork saddle with bucking rolls. Bucking rolls, sack or saddle blanket rolled up and tied across the fork is allowed. Riders can hold horn, cantle, night latch (rope or safety strap tied through saddle gullet to help the rider hold on), or rope strap. No spur-out required and loss of stirrup is allowed. No hobbling of stirrups (tying stirrups together under the belly of the horse) or binds on stirrup leathers (tying stirrup leathers to cinch and off-side billet). No “chapping” a horse at the gate (throwing or slapping a pair of chaps or raincoat at the horse). Same hand must remain on rein throughout ride. Fanning with hat is allowed. Quirts will not be allowed. Coiled rope is allowed on saddle, attached by rope strap. Ride is for 8 seconds. Two well qualified rough-stock judges each score horse from 1 to 25 points and rider 1 to 25 points (100 points total possible for ride). The rodeo event is open to amateur and professional riders. All twenty bronc riders rode at a “long-go” kick-off performance on Thursday evening. Before the bronc riding began, there was a Calcutta auction held. Each bronc rider was auctioned off and sold to the highest bidder. The Calcutta paid $1,470 to the bidder who bought the winning rider for the evening. Rolly Lisle of Bruneau, Idaho, [print 1] earned the winning bronc riding score, which paid $1,000. Joe Heguy of Elko, Nevada, and Josh Smith of Winnemucca, Nevada, split second and third places and were paid $500 each. The twelve highest scoring bronc riders out of the original twenty in the “long go” came back on Friday and Saturday evenings during the PRCA performance, six riders each evening in a “sudden death “ ride. Based on a one-head score, a champion was declared after the bronc riding ended on Saturday. Cody Coucham of Lee, Nevada, and Eli Bur of Victor, Idaho, had identical scores and split first and second places. Each was awarded $2,400. Dan Hoots, Spring Creek, Nevada, placed third and collected $1,200. Since there was a split for the first prize, in true Nevada cowboy fashion, the buckle winner was decided by the flip of a coin. Eli Bur won the coin toss and the World’s Champion Buckle. The $8,000 purse and the championship buckle that these 20 bronc riders rode for makes this, no doubt, the richest Old West Bronc Riding held anywhere in the United States today. Sell out crowds at the Elko County Fairgrounds watched real working cowboys and buckaroos from around the west ride broncs with their regular stock saddles and ropes for a lot of money, prizes, and bragging rights. Forty ranch bronc riders signed up for the Old West Bronc Riding during a three-day special event at the Silver State Stampede in Elko, Nevada. There were working ranch cowboys competing from Nevada, Utah, Wyoming, Oregon, South Dakota, Colorado, Washington, Montana and Texas. Twenty riders rode on Thursday night and ten rode on Friday in the “long-go.” The top fourteen riders came back in the championship “short-go” round on Saturday night. A Calcutta was held on Thursday evening selling all forty of the bronc riders to the highest bidders. When the scores were added up, Jack Payne, buckaroo from Jordan Valley, Oregon, came out in first place. Jack received a check for $6,000, a trophy buckle, and a Fredrick Remington bronze, “The Outlaw,” donated by Western Horseman Magazine. Six places were paid in this riding event. This makes the Old West Bronc Riding in Elko, Nevada the richest riding event of its kind in the United States. Wally Blossom from Owyhee, Nevada furnished the stock and the horses did buck! First place Calcutta bidder was paid $3200. The Old West is alive and well in the Great Basin of Northern Nevada. The Silver State Stampede committee would like to see more entries in the Old West Bronc Riding event every year. Sponsorship of the event and of contestants is encouraged. Sponsors’ names will be announced during the rodeo performances. Elko has long been known as the heart of the far West. Elko has been a leader in preserving our western heritage. The Elko National Cowboy Poetry Gathering is a premier western event held each year. The Western Folk Life Center displays horse gear made by working buckaroos from throughout the Great Basin and the West and is open to the general public. If you want to see that the Old West is alive and well, come to Elko in July for the Silver State Stampede PRCA rodeo and Old West Bronc Riding. or call Ralph Chiquete for more information at 775-397-2275 . A version of this article appeared in the December, 2003 issue of Western Horseman Magazine.